Hattecke & Sohn Traditional Cutter Ketch motor Sailor built in Germany in 1973 from Iroko. 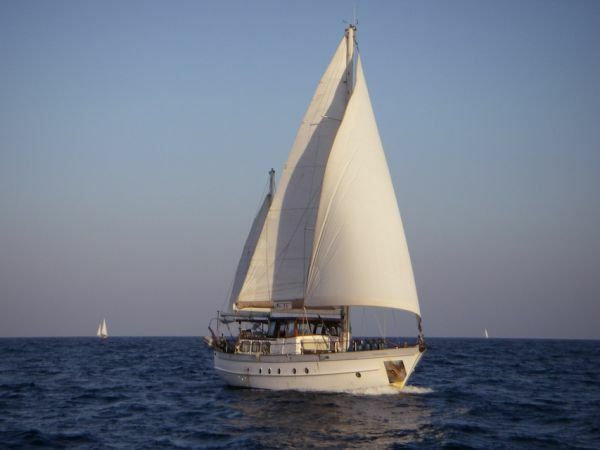 "Nada brahma" is a safe and comfortable traditional cutter ketch (motor sailor) that has finished a "round the world trip" in 2009, beginning in the Mediterranean 2004. The boat was completely restored from the keelson up to the mast tops in 2003. Invested about 400 thousand euros. 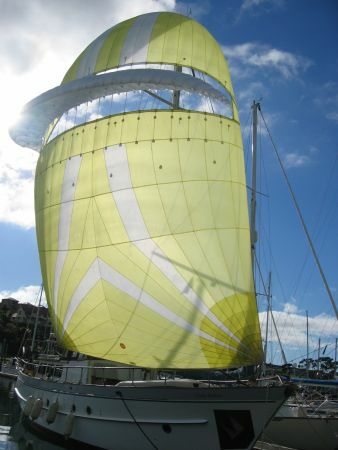 New main boom, mainsail and genoa in 2007 (New Zealand). The boat was given a complete overhaul at the "yat lift ship yard near Bodrum (turkey) after completion of the circumnavigation. Invested 18 thousand euros (caulking, antifouling, engines etc). All calculations and plans, the original old plans as well, and a lot of photos to documents of the restoration are available. A survey is available as well, made by a surveyor 2010 recommended by Pantaenius with estimated value 180 thousand euros (without vat). The boat is very suitable for offshore cruising as well as family sailing anywhere. 2 x Perkins diesel, type 4.236 . 1973. 2 x 70 hp, 2200 rpm. General restored 2003, overhaul 2009. Each engine has its own instruments to control rpm , oil pressure of the engines, temperature and oil pressure of the gear-box. Voltmeter of service- and engines-batteries. All instruments located in the wheelhouse. Boatmatch Tip: Want more advice about buying this Hattecke & Sohn Traditional Cutter Ketch Motor Sailor? Checkout our Boatmatch Buyers Guide! The Electrical Systems of this Hattecke & Sohn Traditional Cutter Ketch Motor Sailor - All wirings and connections are renewed. Starter-batteries 24 volt are brandnew. Isolating transformer with soft start (Greiff engineering, Germany). 28v/60a "Valeo" (marine engine generators). 2 shore power cords at bow and stern. Raymarine colour plotter pathfinder rl 80c plus with radar unit m 82652 Ransome 4kw. Mk 30 with an own GPS. Raymarine multicontrol (wind, speed, depth etc) located in the central control panel. Interphase probe and Interphase scout sounder (horizontal and vertical ultrasound scanning so called "underwater radar"). Boatmatch Tip: Need advice about possibly insuring this Hattecke & Sohn Traditional Cutter Ketch Motor Sailor? Checkout our Boatmatch Insurance Guide! Icom VHF marine ic-m 601 , GMDSS, Raymarine gps RN 300. Back up ("flying") VHF, complete mounted and ready to use. Stay. Smart tuner SG 230. DSP multimode pactor iii controller SCS TTC. 2 kw Lofrans, type Titan TT 000637. 24v. Remote control switches beside the windlass and in the wheelhouse. Main anchor 45 kg, second anchor Fortress 15 kg, stern anchor. 8 person lift raft, life jackets. Spectra watermaker MPC 150 24 v (has to be repair ).
. Contact the seller of this Hattecke & Sohn Traditional Cutter Ketch Motor Sailor for more details. hull renewed 2003. Steps at both masts. Two trade wind booms. The hull is new screwed with CA 3500 stainless steel screws (made in Austria). Main boom and lazy jack with lazy back renewed 2007. Andersen 46st, 1 x Andersen 40st, 2 x Andersen 28st. Sails of the Hattecke & Sohn Traditional Cutter Ketch Motor Sailor - Mainsail ("Doyle Sails" 41 Sqm, 10,3 Oz Dacron), 5 X Full Battens, 2x Reefs. Dacron), Uv Sunshade (Both Sails Renewed 2007). Lots of deck space to relax (Iroko deck 16mm on marine plywood/epoxy). The steering unit with plotter/ echo sounders/all control-instruments/ VHFand so on is part of a great deckhouse with a 360 degree view and a settee that seats 6. It is covered by a transparent roof with a good view to the mainsail and weather waves above. The deck saloon has a lounging area with settee made out of leather that seats eight. Control panel of the main plotter is installed in the deck saloon. Water system, 2 refrigerators , a lot of storages and a small bar is part of the deck saloon. In the cabin part of the vessel the central control panel is located (pumps, ham-radio with Pactor iii, VHF, GPS, back up plotter, Tridata, battery, control, tank control, fuses etc ). The owner cabin with double bed, storages, mirrored wardrobe, hanging locker, shelving and drawers is in the middle of the boat on starboard side. Opposite the owner cabin there is a "library" with leather settee. By sophisticated construction of the doors it is possible to arrange these to form a big owner cabin. Just beside there is a washroom located (shower cabin, big wash table with integrated sink, electrical head, hanging lockers). A 2 berth cabin is opposite and just beside the central control panel. A 4 berth cabin is located in the front of the vessel. Lockers, shelving and a lot of small covered compartments. In the bow there is the laundry (washing machine), a washbasin and a head. The boat is varnished mahogany in the interior. The flooring is teak in the washrooms and carpet is fitted in the cabins (with access to bilges). All plumbing fittings and pipes, all pumps and all tanks are renewed 2003. Pressure fresh cold and hot water system, pressure salt water system, 4 electrical bilge pumps (automatic/manual), 1 manual bilge pump. Boatmatch Tip: Have a question about the accommodation of the Hattecke & Sohn Traditional Cutter Ketch Motor Sailor? Contact the seller via clicking on the registering interest button above. The owner realised his dream of cruising around the world. This was a great and enjoyable adventure, however he is s now 70 years old and likes to stay in New Zealand. Hattecke & Sohn Traditional Cutter Ketch Motor Sailor For Sale is lying in Cesme Near Izmir Airport (Adb), Turkey. At 16.05 metres (approx. 52.66 feet) this Hattecke & Sohn Traditional Cutter Ketch is a bargain at €115,000.